Copy of original bank statement (not older than 3 months) with your Switzerland address reflected on it. Each of your beneficiary will be assigned an ID no. If you have a new beneficiary, please call XXXXXXX before transferring so that we can provide you another ID. 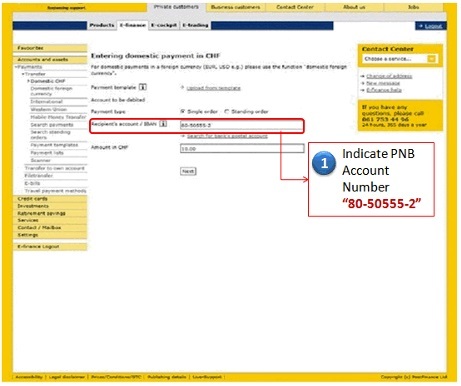 Indicate PNB Account No 80-50555-2. 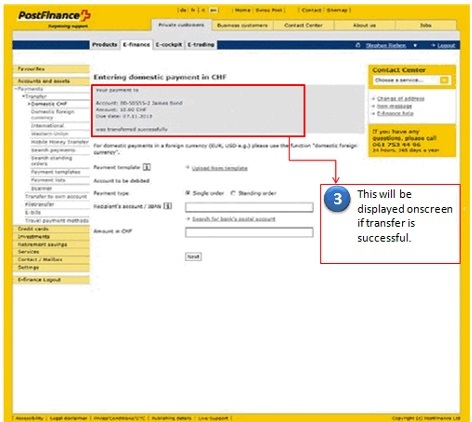 A confirmation screen will appear once the transfer is successful. Copy of original bank statement (no older than 3 months) with your Switzerland address reflected on it. All OFWs who will send money from Switzerland to the Philippines. 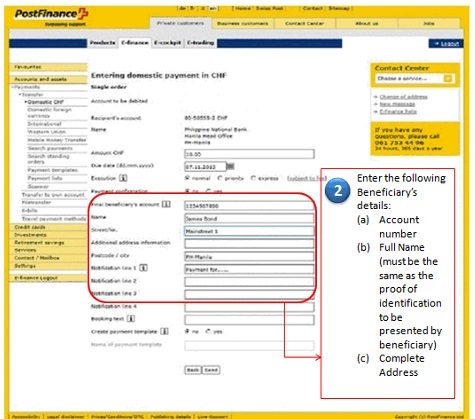 Do I have to pay a fee if I enroll to PostFinance Remittance Service? No, enrollment is free of charge. How do I update my profile and my beneficiary’s profile? You may download the Remittance Information Form or the In-Payment Request Form from this website. Fill out the form and send it back to us thru email: customercare@pnb.com.ph or fax it to 044 207 727 9447.
Who will I contact if I need to make some changes to my remittance? You can advice us regarding the changes to your remittance by sending an email to customercare@pnb.com.ph or call 044 20 7592 3000 then press 4. Is there a ceiling on the amount of remittance? A remitter can send as much as EUR 4,999.00 within a month. What will I do if I want to refund/cancel my remittance? You can send your request for refund or cancellation to customercare@pnb.com.ph or fax it to 0044 207 727 9447 or call 044 20 7592 3000 then press 4. What will I do if my remittance was not processed? You can send an email regarding your unprocessed remittance to customercare@pnb.com.ph or fax your query to 0044 207 727 9447 and we will advice you as soon as possible. In case I have questions/complaints to whom do I address them to? 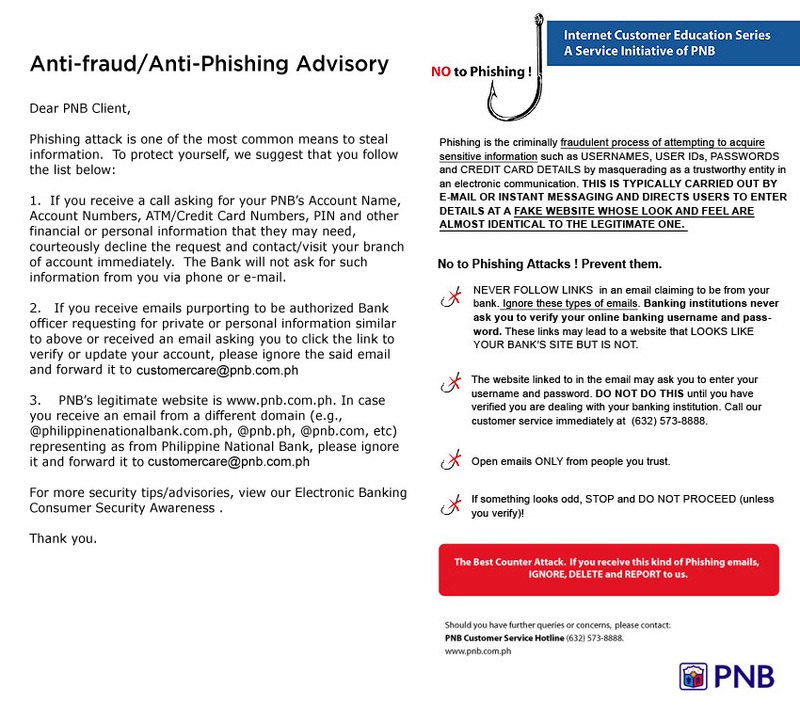 You can send your questions/complaints to customercare@pnb.com.ph or fax them to 0044 207 727 9447 or call 044 20 7592 3000 then press 4.